Come join OASIS Saturday June 30 for Planetary Defense & Asteroid Exploration Mini-Conference 2018, followed by a happy hour! The event described below, organized by the local section of the American Institute of Aeronautics and Astronautics (AIAA), may be of interest. 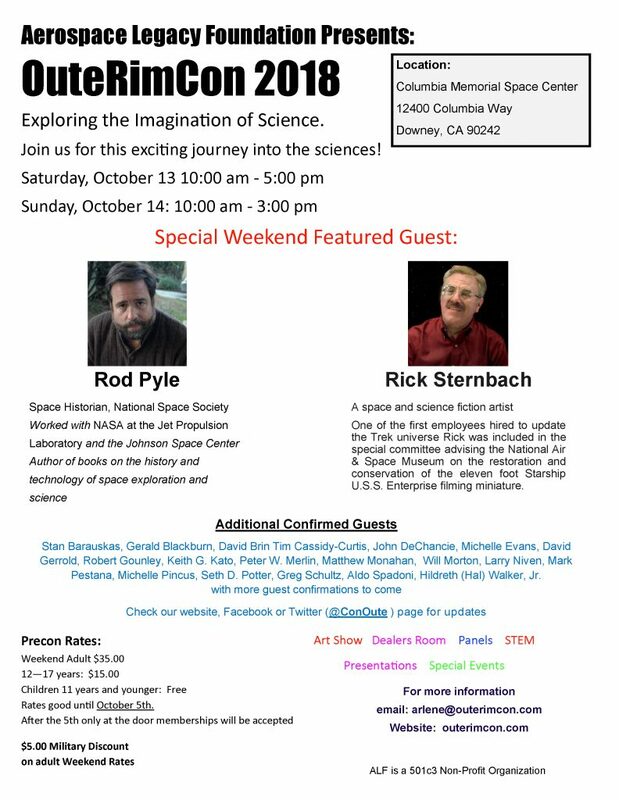 OASIS and the Aerospace Legacy Foundation will have a joint exhibit table there, so if you attend, be sure to say hello. Afterward, the OASIS members, and anyone else interested, will head over to the nearby Redondo Beach Pier for drinks and food. We will try to get into Barney’s Beanery, but if it is too crowded, we will go elsewhere. If you miss the AIAA event, please feel free to meet us at the Pier. Look for us at Barney’s Beanery. If we are not there, please text Seth Potter at (310) 245-2592, and he will text you our location. Those who join us can order as they please, and we will all need to pay our own way. The pier is walking distance from the library, but it will probably be necessary to move your car out of library parking when the library closes after the AIAA event. 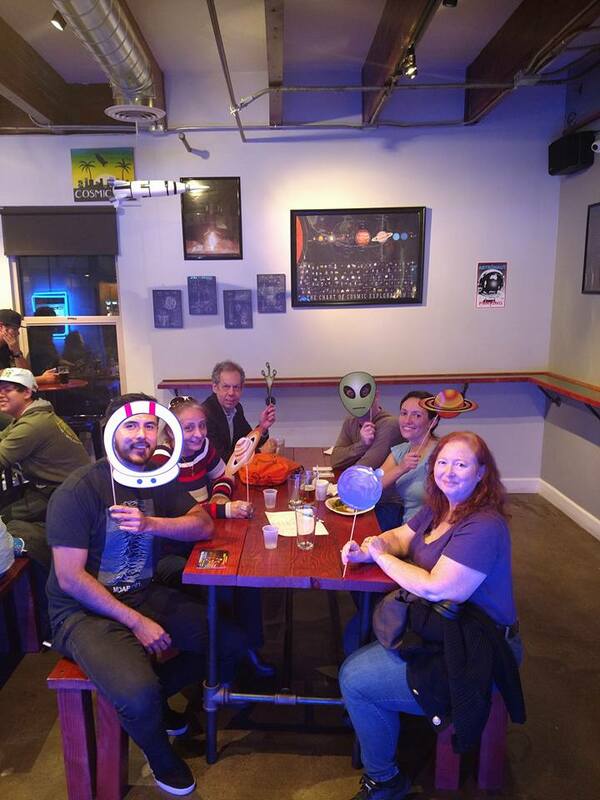 The OASIS Social at the Cosmic Brewery was a great success! They had a telescope event in front (they have such events every Friday and some Saturdays “Tacos and Telescopes”), a pop-up taco stand (they have other pop-up food stands at other times, such as vegan), space-themed art, a TV playing Star Trek TNG episodes, and pour your own beer so you can pour your own flights. We closed down the place – the event started at 3 pm and OASIS folks and guests stayed until 10 pm. And the place is pet friendly. Several people had doggies there. The place also hosts pet adoptions and had fliers about pet adoption event. They also host special events. OASIS will likely host one there in the future! OASIS Annual Picnic, August 19, 2017. A good time was had by all! 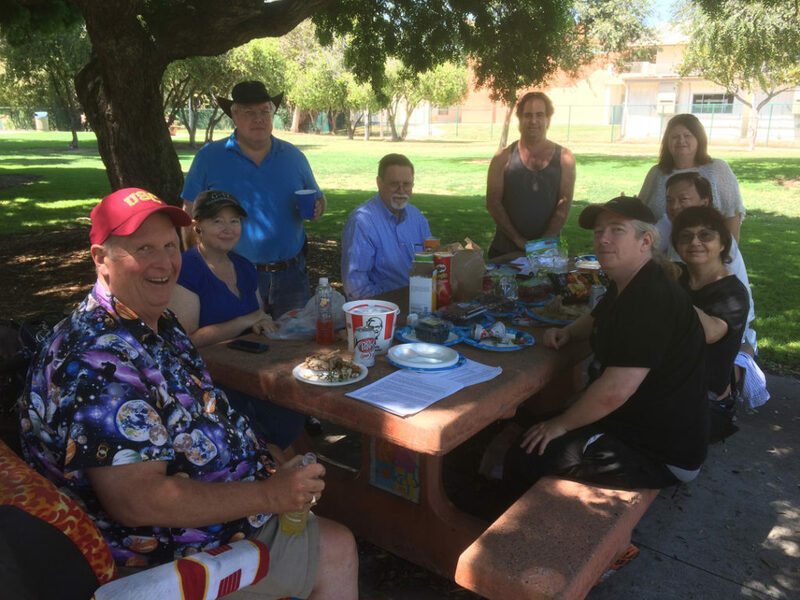 OASIS Annual Picnic at Polliwog Park, August 19, 2017. Great people and lots of event planning! 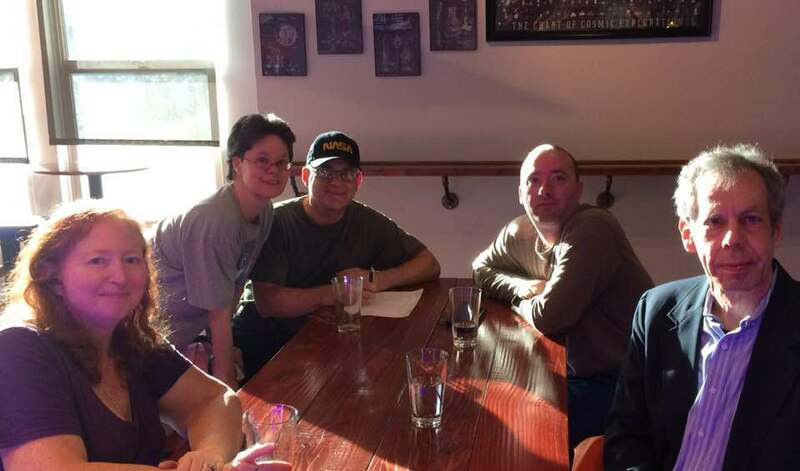 Watch for future events coming out of planning meetings such as this one. Clockwise around the table from bottom left: OASIS member (and go-to for STEM events) Dean Davis, OASIS Membership Chair Arlene Busby, OASIS Board Member David Bliss, NSS Chair of the Executive Committee Mark Hopkins, ISDC event planners extraordinaire Mike Kobrin and Aggie Kobrin, OASIS’ newest member Tri Caodo, OASIS Vice-President Lisa Kaspin-Powell, OASIS member (and former board member, we’re trying to drag him back) Gareth Powell. The October 2017 Odyssey was emailed out to the OASIS members! To OASIS Members: please check your email to make sure you got it. Like talking about space to space and science fiction enthusiasts? OASIS is proud to be providing space programming and a fan table. Joining us at the table will be the Aerospace Legacy Foundation, an organization dedicated to the preservation of aerospace history and promotion of our aerospace future. OASIS is truly honored to collaborate with ALF. We need volunteers to help us at the table. Spend an hour or so at the fan table chatting up con-goers. Talk to party guests about OASIS activities. If you’re a shutterbug, we’d love to have pictures! If you attend any especially interesting talks, we’d love to see a write-up! We want both for The Odyssey and for our website. And the best part is that you’ll have fun in the meantime! You can also register at the event. Come support team Titan Rover, Cal State Fullerton’s team, in the University Rover Challenge! We are Titan Rover, a multidisciplinary team of over 40 engineers and scientists at Cal State Fullerton striving to compete in an international competition for the second straight year. The competition, called the University Rover Challenge, is hosted by the Mars Society and Protocase and is conducted annually at the Mars Desert Research Station in Hanksville, UT. The mission is to create a robotic device capable of assisting the first astronauts that arrive on Mars. The Rover would thus need to traverse a rough terrain and allow astronauts to accomplish tasks and collect scientific data from an enclosed habitat. Titan Rover in general helps to train and mentor the next generation of engineers and scientists. Please help preserve the history of space advocacy! The grass roots pro-space movement has long worked for the day that outer space will be open for everyone to live, work and play. Much of the video history of the movement, however, exists only on old analog tapes in the closets, drawers and garages of the volunteers who recorded it. Long-time OASIS member David Bliss has been part of the movement since joining the L5 Society in 1986, and from 1990 until 2007 he volunteered his time and skills to videotape the National Space Society’s annual International Space Development Conference as well as events sponsored by local NSS chapters. The NSS is putting together a digital video archive for access by the society leadership and researchers. The physical media is then sent on to a Museum in New Mexico for long term storage. While some of Bliss’ footage has been transferred to DVDs and donated to the archive, the process has been slow and video tapes do not last forever. Money is needed for supplies and maintenance of aging equipment to speed things up so this footage can be preserved before it is gone forever. By supporting this Patreon Campaign you will be providing the funds needed to digitize this footage and prepare it for long term storage, preserving this record of the pro-space community. Please help send Dr. Jim Busby’s ashes to space! I am Arlene Busby, widow of Dr. James M. Busby, who died on June 1, 2016. As an aerospace historian people would seek out my husband for his vast knowledge and expertise. Jim would get a childlike grin and gleam in his eye as he taught children and adults about the space industry past and present. Anyone that engaged Jim in a space conversation was in for a delightful and fascinating lesson. Jim received much respect from Space Historians, Astronauts and Engineers alike regarding his knowledge and his Reverence for the subject of aerospace. Despite his great love for this industry he also had an empty place in his heart. Jim would look up in the sky with wonder and sadness because he knew that while he lived he would never make it to the place he always wanted to go SPACE. I cannot think of a more fitting tribute to the love of my life than to send a token amount of his ashes into space. The money you give will go towards making this happen. There is a flight in November, 2016. Room on this flight is limited. So, I will need the money as soon as possible to reserve a space for him. If I miss getting his ashes on this flight he may have to wait 2 or more years for another opening. My husband was and is everything to me. In order for me to honor him and our deep love for each other I cannot think of a more appropriate way to make his dream of space travel come true. I hope you can find it in your heart to help me accomplish this so I can help him fulfill his lifelong dream. On Saturday, August 13, the Columbia Memorial Space Center will honor Dr. James M. Busby with a plaque and remembrances. Please join us to help celebrate Jim’s life.